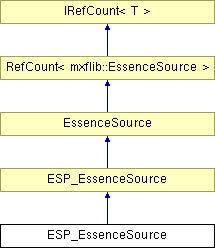 Construct and initialise for essence parsing/sourcing. Get the size of the essence data in bytes. Get the next "installment" of essence data. Get the preferred BER length size for essence KLVs written from this source, 0 for auto. Class for EssenceSource objects for parsing/sourcing <Type> essence.